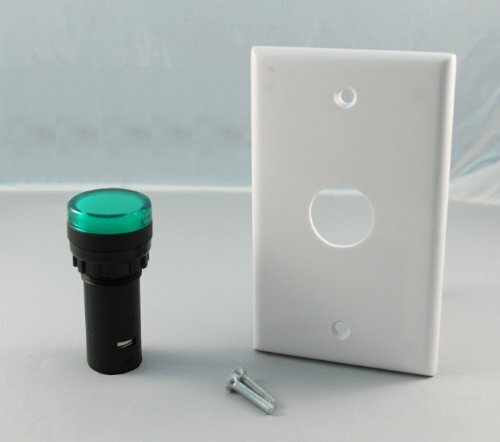 LED 22mm Indicator Light With Wall Plate, 120VAC Green by LEDAndon at In The National Interest. MPN: LD-2648-911G. Hurry! Limited time offer. Offer valid only while supplies last. This Wall Plate indicator fits most single gang outlet box. Bearing a 22mm Green LED indicator light this allows for versatility in use and control. This Wall Plate indicator fits most single gang outlet box. Bearing a 22mm Green LED indicator light this allows for versatility in use and control. Common signal uses include: off limits, do not enter, fault, stop, caution, aid required, line down, off, required action, behind schedule, parts jam, among other time-sensitive or demanding issues. The wiring terminations are screw terminal interface. Simply run a +120V hot and -GND neutral wire correspondingly to light the indicator appropriately. Power consumption is 0.8W The indicator light bears the CE and TUV markings for safety and conformity. Gang box not included.